Study materials to help learners to practise and prepare for the Functional Skills qualification in Maths at Level 2. 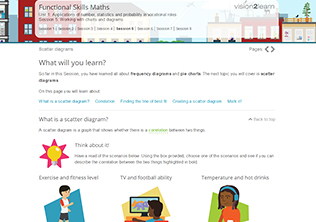 This resource gives learners the essential skills and knowledge that they need to support the achievement of their Functional Skills qualification in Maths at Level 2. Learners can work through engaging, interactive study sessions, including real-life scenarios with practical tasks to help them to practise their maths skills and apply their knowledge. The resource will enable pupils to become more confident and capable when using area and volume, working with numbers, interpreting data and using equations. In these resources, learners will work through 3 Units to help to prepare for a Functional Skills Maths external assessment.